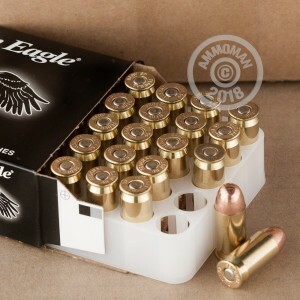 Looking for a top of the line range training round? 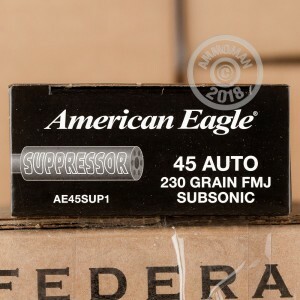 This is Federal's 45 ACP American Eagle Suppressor Subsonic 230 Grain FMJ ammo. American Eagle Suppressor offers superior accuracy in suppressed firearms. Each of the cartridges feature a subsonic loading for increased noise reduction through suppressors. The Suppressor line also utilizes powders that burn cleaner and result in less fouling than other conventional ammo. These rounds are new production, non-corrosive, brass cased and boxer primed. Federal has been around since 1922 and known for supplying a quality, reliable product. 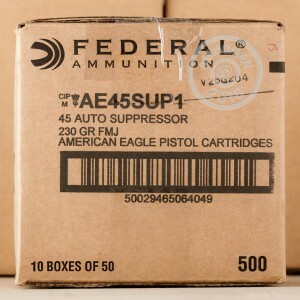 Their ammunition is manufactured in their Anoka, Minnesota headquarters facility. Pick up this case today and get Free Shipping on your order over $99 from AmmoMan.com!